Last week I started a new job with a sizable commute, and celebrated my birthday off and on for a few days. I admit I’m still adjusting and I’m feeling pretty tired. I miss blogging enough to whip out this post instead of jumping in the shower (no more morning showers). 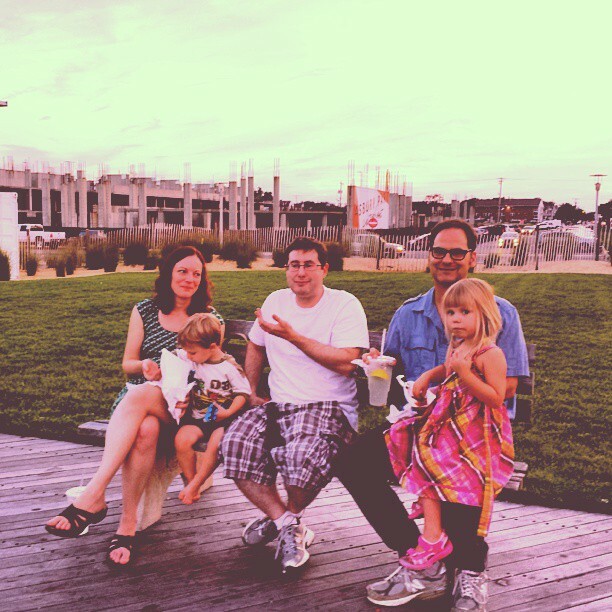 We went to Asbury Park this weekend two days in a row trying to get seated at an unforgettable pizza place. This photo shows us eating fries for dinner after getting shut out of the place on Saturday. There was a kid playing some decent drums on the boardwalk and Hugo and his friend broke out into dance. This is an Instagram video so I have no idea if it will embed. I miss everyone! I’m just holding it together and collecting energy in a bucket so I can be myself again soon. If you don’t already, follow me on Twitter where I don’t have to be so coherent. The job’s great, by the way, and Hugo is doing great. He hasn’t complained at all about his extended school hours, in fact he seems to look forward to it more than ever. Two days with the power back and I’m still not taking it for granted. I knew we were fortunate that the weather was so mild after Hurricane Irene last year – no need for air conditioning or heat for the four days we had no electricity. This week was cold! And the sun sets so early. Our power went out Monday around 8:40 PM. We had hot water (yay!) but no heat or stove. The weather had been so mild that our heat hadn’t been on for more than a week. It felt strange to be cut off from my usual Internet tether. My phone didn’t work until Thursday (thanks, Sprint). Hugo was happy to be bundled up around the clock. He actually slept better without a night light so that was a valuable lesson. He has two molars coming in though, and he and Rick caught a cold so the good nights were short lived. We had a laptop and iPod for Hugo to watch Chuggington in the evening. Our friends with power let us warm up and recharge Wednesday. We bought two pizzas Wednesday night, which made me relax about food for a little while. I didn’t really feel any panic until we woke up Thursday morning to 58 degrees inside. I could see on Rick’s work phone (our only Internet source) that it was going to be in the 30s at night this weekend. Our guinea pig is the most temperature-sensitive member of the family. We brought her down to the very dark, but significantly warmer basement. I was able to go to work Thursday. Vonage opened its doors to employees’ families for light and heat, even offering shelter over the weekend. I finally unraveled a little there, as I sat safely at my cubicle. I told myself I wouldn’t look at pictures of the devastation but I did. We weren’t told to evacuate this time; it seems we live on pretty high ground despite being a block from the Navesink River. But we were worried. My basement got wet every time it rained in the spring, but somehow we were spared. 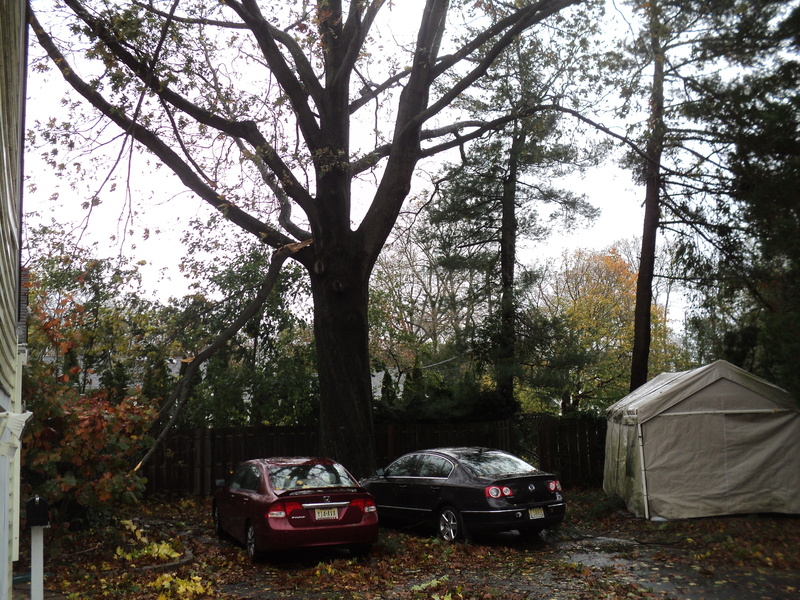 The huge tree at the end of the driveway did not fall on the cars. A big tree fell in front of our house, but obligingly lined up right in the gutter and didn’t block the driveway. And the last two places we lived since Hugo was born were devastated. Highlands and Union Beach. One of my hurricane-savvy friends from Florida said the photos reminded her of the tsunami in Asia in 2004. I think all of our hearts are broken. Now it’s time to replenish our supplies and my consulting company didn’t open to do payroll this week. Radiant Systems is located in South Plainfield but they use ADP for payroll. They withhold wages for four weeks but print and mail checks biweekly. I didn’t get an email update from them after the storm, so I called yesterday. Some sarcastic person informed me that there had been a hurricane (I’m not sure where their offsite location is, maybe India?). He said they were going to open and send out payroll on Monday but I wonder. And I see that their website is down now. Argh. Today I want to buy diapers and formula to donate to the local shelters. I know that feeling of panic that comes when you are afraid you won’t be able to feed your baby. We have our health, heat, lights and Internet that we’re happy to share with our friends that have no power. God bless everyone who lost someone or something to this disaster. Update Sunday, November 4: I just heard from Radiant Systems – checks went out on Thursday! Hooray.